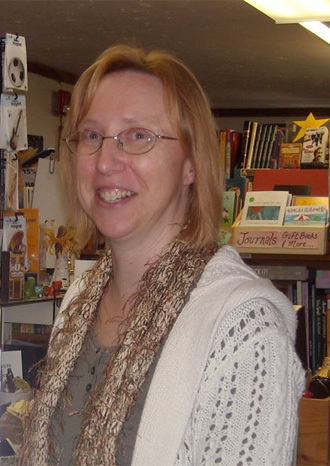 When owner Debra Horan, a 1989 graduate of the Rhode Island School of Design, opened Booklovers’ Gourmet in 1995, she envisioned a cultural community center, incorporating all the arts – literary, visual and musical. “I thought it would be nice to have a local place with events for the community,” she says. “I wanted to have gourmet coffee and cappuccino, a nice place to sit and relax and meet other like-minded people, reading and enjoying the arts. Nowhere else in town had this.” The bookstore’s longevity indicates that her vision has become reality. 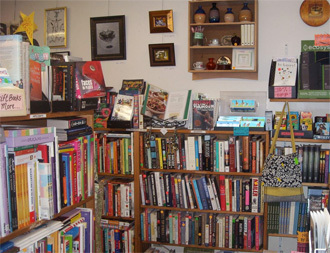 The bookshelves in the main room overflow with new releases, old favorites and classics in every genre imaginable – some at discounted prices. Step into two adjacent rooms and find even bigger bargains amidst a virtual bonanza of used books from a variety of authors. Booklovers’ Gourmet regularly schedules author readings and book signings, giving readers the opportunity to chat with their favorite writers. The children’s section houses Newbery award winners, board books, locally penned stories and everything in between. 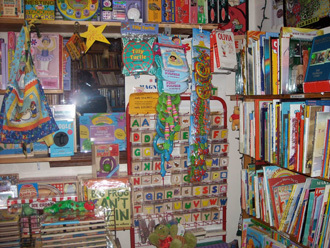 In addition to hundreds of titles, Booklovers’ Gourmet carries Melissa & Doug® puzzles, games, stuffed animals and educational toys to challenge the inquisitive, young mind. As the name implies, Booklovers’ Gourmet includes a café where customers can relax with a hot, cold or frozen drink. From a cup of joe and gingerbread chai to spiced apple cider and 100% fruit smoothies, the beverage menu offers libations for every taste. For at-home sipping, customers can purchase micro-roasted, organic, fair trade coffee (between $11.98 and $12.98 per pound) in several flavors from Hogan Brothers in Framingham, Massachusetts. A bakery case containing an assortment of freshly baked pastries, some gluten or sugar-free, supplied by Phyllis’ Bakery in nearby Putnam, Connecticut, offers a sweet treat to pair with that gourmet coffee. The quiche of the day satisfies those with a heartier appetite. While books are the mainstay at Booklovers’ Gourmet, shoppers will also find a cache of unique crafts. Knit scarves, crocheted hats, handmade jewelry, soaps and candles share shelf space with incense and burners, essential oils and novelty statues. Booklovers’ Gourmet carries a selection of quality greeting cards for every occasion, journals and holographic bookmarks as well as an eclectic choice of music CDs to enhance your reading experience. Horan prefers to support local artisans and/or family-owned companies whenever possible. 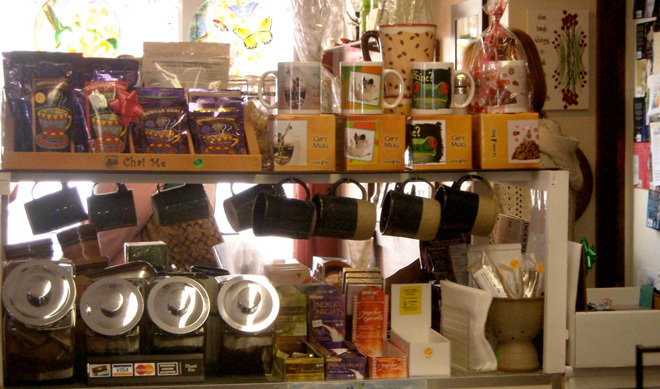 “I try to pick items I know my customers will like. I carry a mix of things so people will see a variety,” she notes. Space constraints force Horan to limit the amount of product she displays, so she utilizes “the art of arrangement,” a strategy that accounts for the quick turnover of these handcrafted items. Every month, Booklovers’ Gourmet sponsors an art show that spotlights local painters, photographers, illustrators and mixed media artists. “In February, I do a group show for those artists who don’t have enough pieces for a whole show. I usually try to have a theme for the show,” Horan clarifies. “Artists can email samples of their work or provide a link to their website. Some stop in with the work. I try to give everyone a chance to participate,” she adds. Amnesty International and a few other non-profit organizations hold business meetings at Booklovers’ Gourmet, an amenity Horan anticipates expanding to more groups in the future. Monthly reading and writing groups provide an outlet for literary discussion, support and socialization. According to Horan, the bookstore’s success can be summed up in one word: connections. “You have to do more than just sell books. You have to bring people in to celebrate books, make it a community involvement and promote the fact that books are important to the community,” she explains.